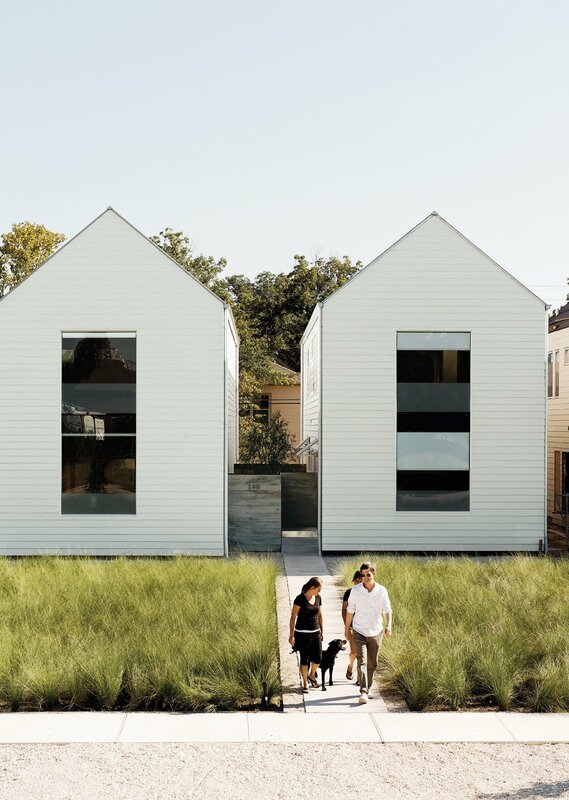 By taking advantage of economies of scale, a Houston native and a pair of mod-minded developers team up to create nine affordable row houses in the Houston Heights. Powered by petrodollars and famously devoid of zoning laws, Houston, Texas, hasn?t always been a friend to historical?or affordable?architecture. 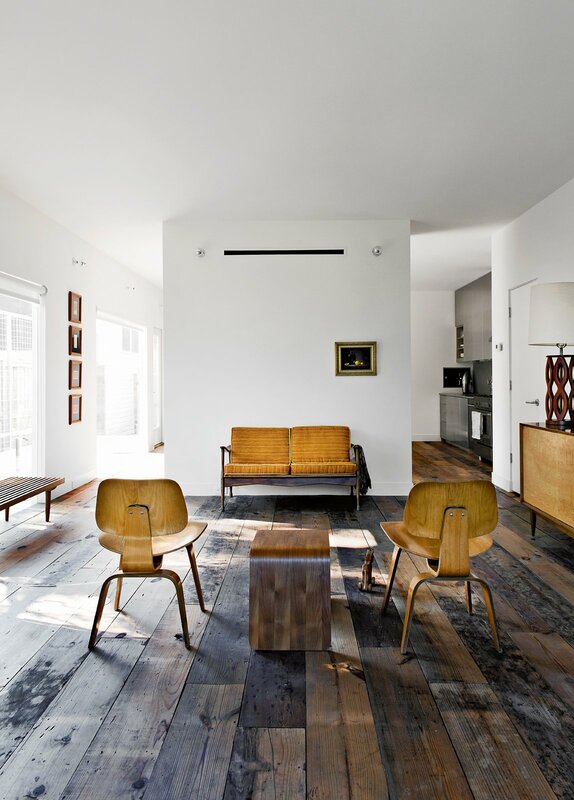 Now this humid Gulf Coast metropolis is getting an injection of updated mid-century cool with Row on 25th. The nine-home development is located in a former no-man?s-land on the northern edge of Houston Heights, a hip neighborhood of tree-lined streets, restaurants, and independent businesses, just a 10-minute drive from downtown. ?The series of pitched white buildings was inspired by the work of architect Hugh Newell Jacobsen. ?The shell of the house is a very simple form,? says Matthew Ford, ?no turns or intersecting roof sections. This allowed me to use solid but inexpensive framing and roofing crews. We are always looking for the point where simplicity and luxury meet.? 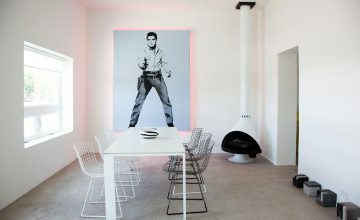 The Row brings together investor and developer Holden Shannon, an airline executive and graduate of Rice University and Harvard Business School, and husband-and-wife development, design, and construction team Matthew and Tina Ford. The Fords, who own Shade House Development and construction firm, Esplanade Homes, are veteran Houston builders specializing in green building. Now based in Atlanta, Shannon usually works on bigger projects, including large-scale terminal redevelopments at airports such as JFK International. It was at Rice that he developed an interest in architecture on a personal level, though. Exploring the oak-canopied avenues filled with multiple housing units around the university, he absorbed how civic planning could benefit the community. So when he decided to build, Shannon wasn?t interested in merely throwing together a tract of homes or a clutch of McMansions for maximum profit. ?Row on 25th is something a little more unique,? he says. 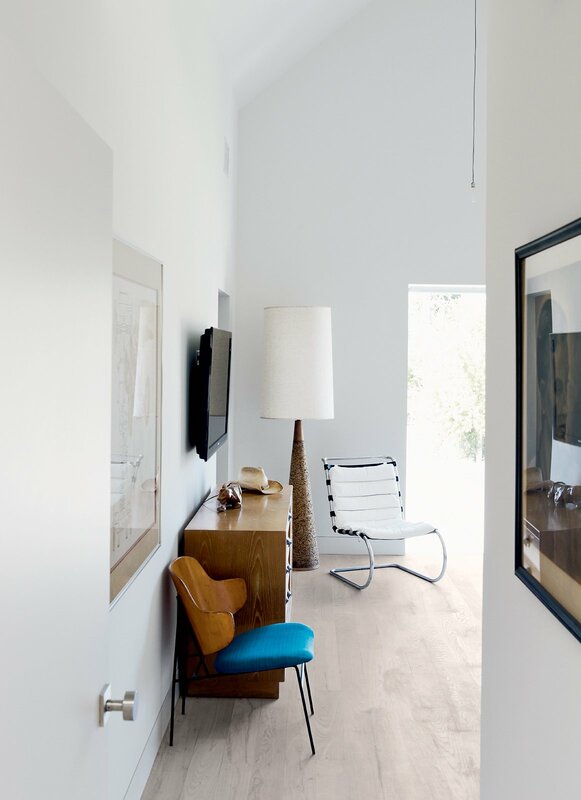 ?The simplicity of the design, the utility of the space?it came together perfectly for a middle-priced project.? 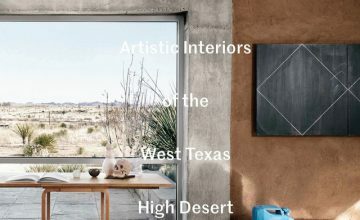 They collaborated on the project with investor and landowner Holden Shannon whose own home on the Row was outfitted by designer Barbara Hill with vintage furniture like a turquoise sofa and pair of mid-century side tables from Houston?s Reeves Antiques. Tina and Matthew Ford, here with daughter Daisy, are the owners of Shade House Development, the company that designed and is building the suite of houses that comprise Row on 25th in Houston, Texas. 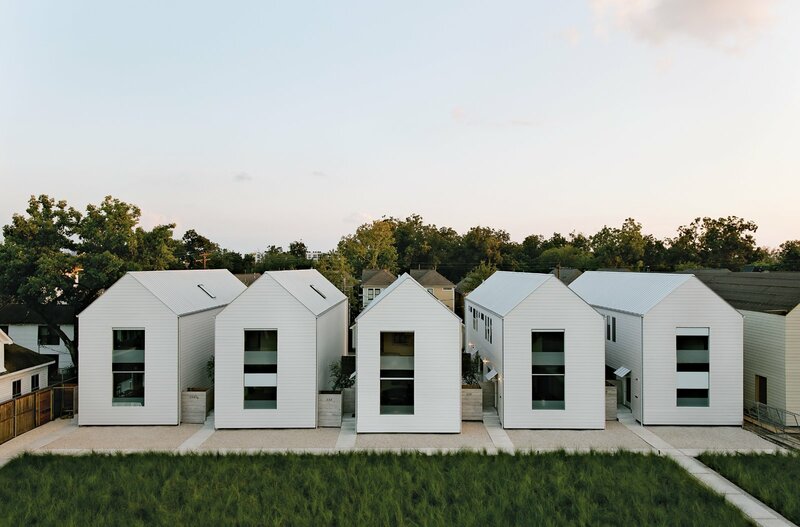 By purchasing acreage on an outlying block and designing the place to be built inexpensively, Shannon and the Fords found the ideal alchemy of site and structure to keep build-out costs to $170 per square foot for each of the around-1,900-square-foot units. ?This project is really the sweet spot of all the different experiences we?ve had,? says Matthew. 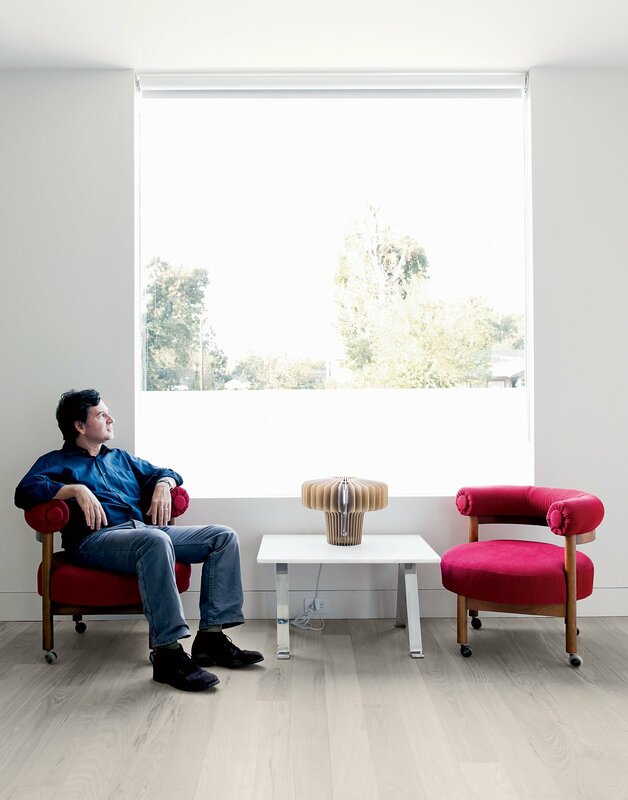 He and Tina have built and designed scads of houses and run a custom fabrication shop in Houston, both of which gave them the know-how to design homes that would be inexpensive to actually produce. An easy-to-build roof allowed them to hire a solid but inexpensive work crew; designing the cabinets themselves and having them made 90 minutes outside of Houston eliminated retail markup; nixing finish work like moldings reinforced the modernist ethos but also saved money on labor; and relying on their own custom design shop and fabrication savvy let them cheaply build the large, dramatic windows that give the simple form an aesthetic boost. 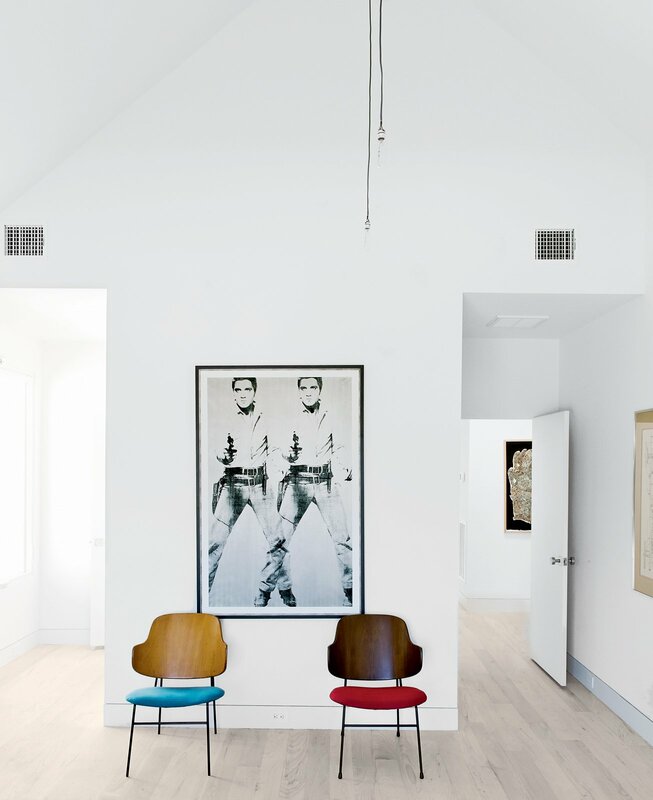 A pair of mid-century perches by Kofod-Larsen sit beneath a print by Andy Warhol in an upstairs bedroom. ?The custom work was obviously more expensive than off-the-shelf items,? Matthew says, ?but absolutely necessary to strike the balance.? There is a richness to simplicity, he explains, but notes that unless you get the details right, simple can sometimes just look cheap. ?Imagine what Row would look like without the large custom front window that cuts through both floors,? he says. ?What building nine homes allowed was for us to bring the pricing down dramatically so that the windows cost maybe 20 to 30 percent more than off the shelf, instead of more than 100 percent more.? The dresser at the other end of the bedroom is by Paul Frankl; the plywood lounge chair is by Ib Kofod-Larsen; and the huge cork-based floor lamp is from Reeves Antiques. The Fords report that in designing many houses?five are now finished?they could take advantage of economies of scale with wholesalers and builders. ?Nine was the number that got the vendors and subcontractors to really work with us in wringing out cost,? Matthew reports. ?The other thing that building nine homes helped us to do was design and build our custom pieces efficiently.? These savings made it easier to spring for longleaf pine flooring, limestone in the bathrooms, custom windows and cabinets, and top-flight appliances in the kitchen. 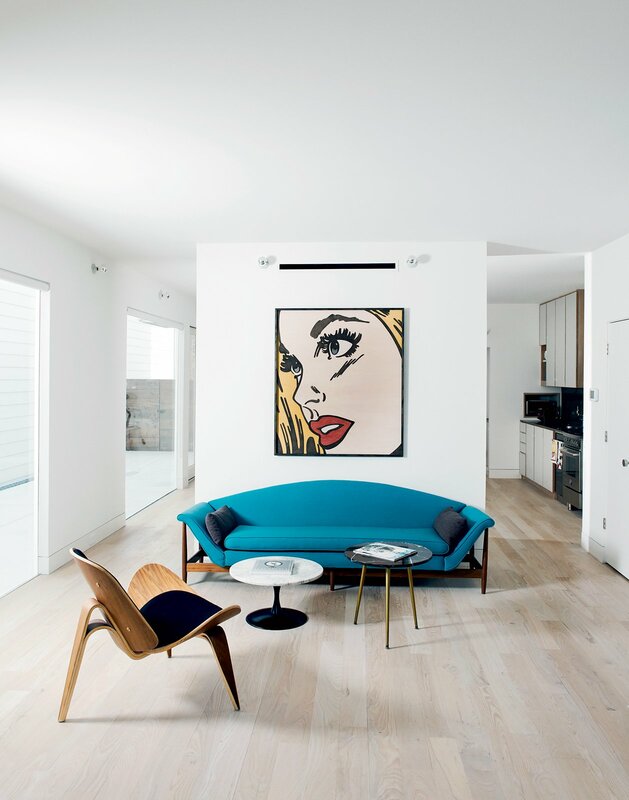 The master bedroom in Holden Shannon?s unit in Houston?s Row on 25th development features a Nook bed from Blu Dot, a pair of Base table lights by Tom Dixon, and a painting by artist Elva Stewart. Amy finds precisely what she?s after in a refrigerator by Sub-Zero in the kitchen. 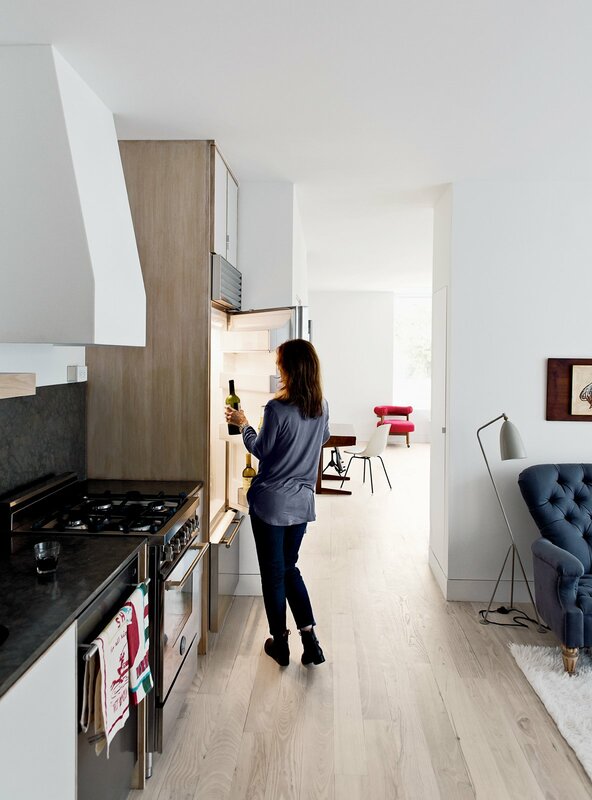 The completed homes have airy, flowing interior spaces flexible enough that renters can tailor them to their needs. Downstairs, each front room is ideal for entertaining, while in the back, adjoining each galley kitchen, there is room for a formal dining area or home office. 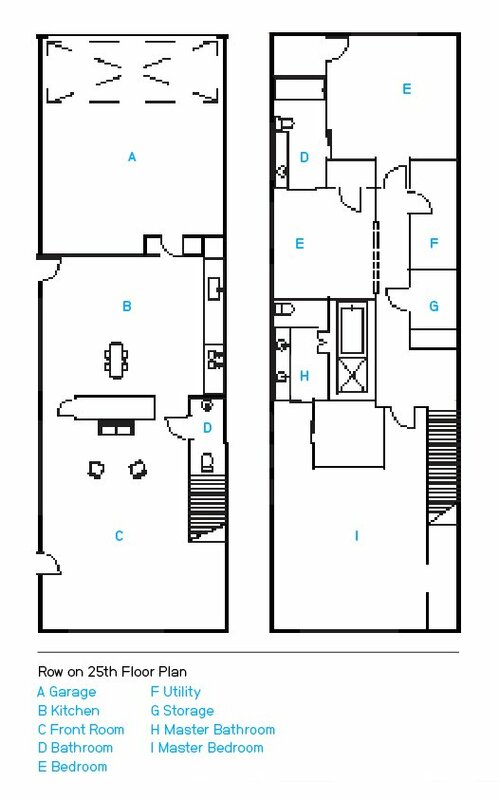 Upstairs, each master bedroom faces the street; a small bedroom faces the back alley and shares a Hollywood bath with a middle room that might house a library, additional bedroom, or den. 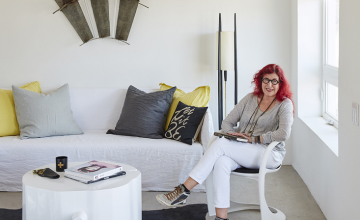 Designer Barbara Hill recollects that Shannon wanted a ?young, funky feel? to his home on the Row. He sits in a vintage chair next to a Satsuma lamp by Jonas Damon for Areaware. Before starting construction, Shannon and the Fords agreed to build a single residence on 25th Street. 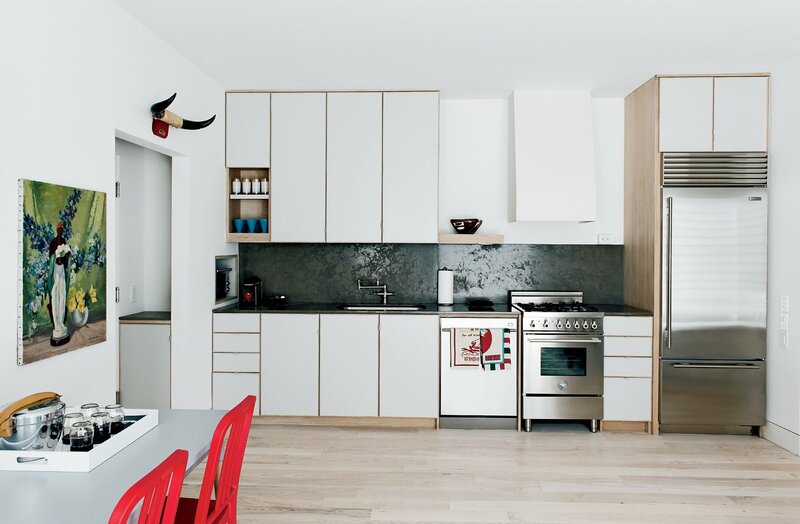 He stayed in the unit on and off for months, establishing it as his Houston home away from home and taking the chance to study its dimensions and get a feel for the lighting, finishes, and comforts that would guide the rest of the development. ?It didn?t start the way it ended up,? he says of the unit that he still occupies whenever he?s in town. ?I didn?t want to build nine homes that had never been lived in. We played with the houses like a designer would play with a CAD drawing. We added windows, moved the front wall out, and enlarged the skylight.? He then hired noted designer Barbara Hill, with whom he?d worked before, to outfit his pad with reconditioned vintage furniture. 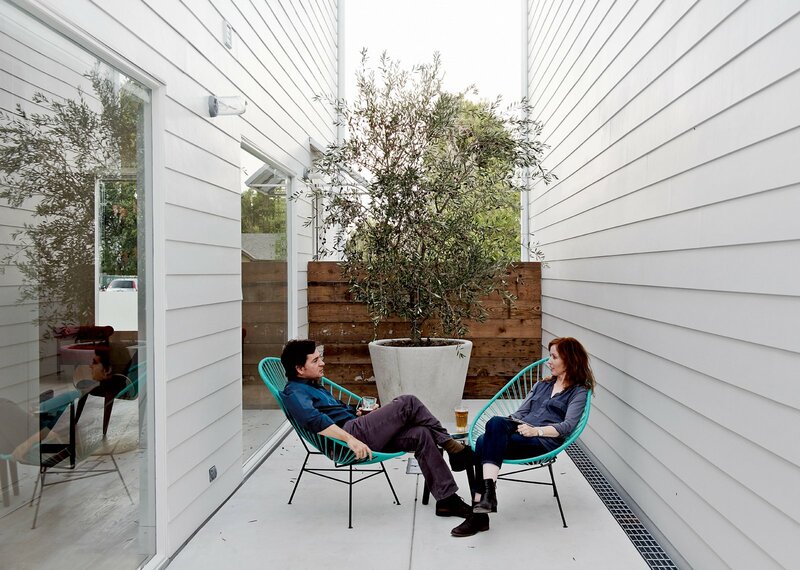 Shannon and his wife, Amy, take the air on a small patio in two Acapulco chairs. By designing the custom cabinetry themselves, and journeying outside Houston to have them made, the Fords saved a bundle?money that they invested in appliances such as this highly efficient dishwasher from Asko, a Professional Series range from Bertazzoni, and an Energy Star?rated BI-30U fridge by Sub-Zero. The mutability of the space and the purity of the design were largely what drew early tenants Lauren Strongin and Joseph Walsh, professional dancers with the Houston Ballet. Prior to landing in the Row, the twentysomething couple searched in vain for similar square footage at comparable rent (around $2,850 per month) downtown. Now, the pair claims good fortune at discovering this gem in the Heights. ?I?ve always been drawn to things that people have built mindfully,? says Strongin. ?The house is so strikingly serene.? 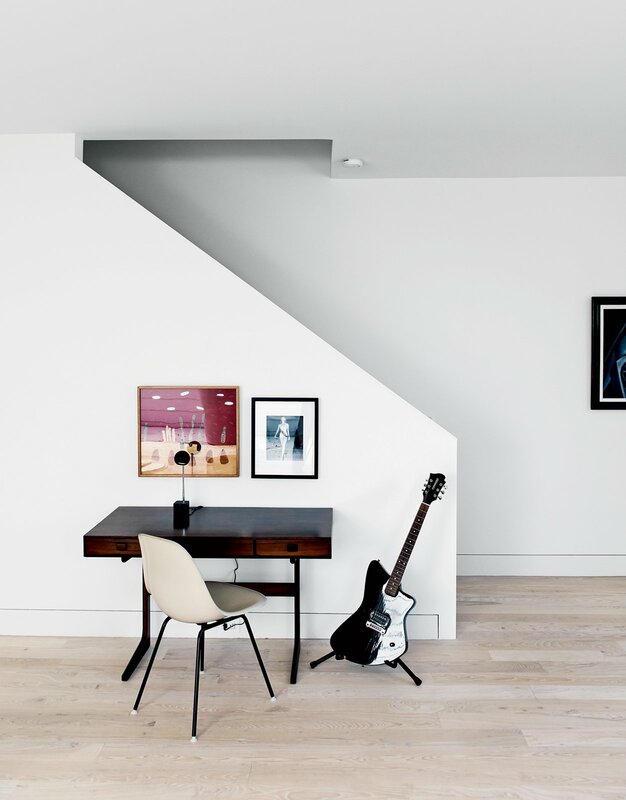 A black electric guitar, a vintage rosewood desk, and a side chair by Charles and Ray Eames sit at the foot of the stairs just beneath a photo of designer Barbara Hill herself competing in the 1956 Miss America Pageant. For his part, Shannon anticipates spending more time at the Row, where he?s looking forward to cultivating a design-minded community that sees the project?s value beyond its enviable sticker price. ?I was not going to analyze every decision on the potential return on my investment,? he says. ?I wanted something that was nice to look at and spoke to a vernacular of restraint. It?s a splash of clean and a healthy dose of rural.? Lauren Strongin dances in front of the custom window designed by Shade House Development.? Joseph Walsh and Lauren Strongin, seen here in their dining room, have also kitted out their unit with vintage furniture.? Walsh and Strongin’s living room strikes a more rustic note. ?